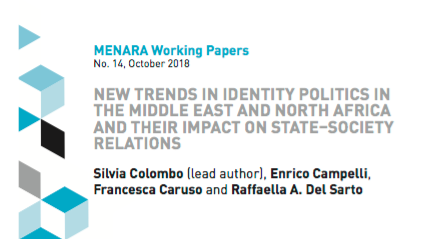 “New Trends in Identity Politics in the Middle East and North Africa and Their Impact on State–Society Relations”, by Silvia Colombo, Enrico Campelli, Francesca Caruso, Raffaella A. Del Sarto, published in MENARA. 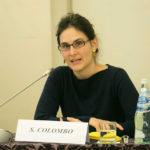 “State-society relations in the Middle East and North Africa (MENA) have been deeply impacted by the dynamics around collective identities in the aftermath of the Arab uprisings and of other domestic and regional far-reaching developments, such as the failed coup attempt in Turkey or the ramifications of the Syrian conflict. It is therefore of utmost importance to discuss the changes (or lack thereof) in the articulation of collective identities, what pressures shape them, and what impact this has on the societal actors and ultimately on their relations with the state institutions and policies. In this regard, two trends can be identified whereby pluralization and hybridization in certain countries, for example, Morocco and Tunisia, stand in opposition to entrenchment and polarization, as illustrated by the Israeli and the Turkish cases. The result is heightened conflictuality in state–society relations and within societies at large in the MENA with the risk of spillovers at the regional level.